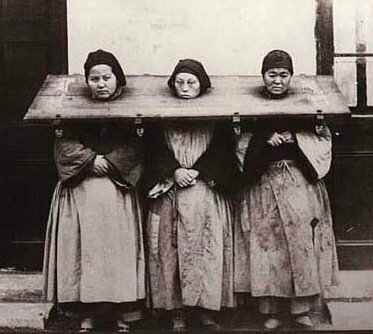 On this date in 1864, the sins of the father were visited upon the son when the Qing Dynasty dealt a coup de grace in what is perhaps history’s bloodiest civil war, executing the luckless teenager to whom leadership of the Taiping Rebellion had fallen. Strangely little-known, the Taiping Rebellion shook the weakened Chinese state through the middle of the 19th century, nearly to its very foundations. From 1851 until the 1864 death of its queer leader figure, prophetic Christian convert Hong Xiuquan, it maintained its own state in southern China, the Taiping Heavenly Kingdom. Also of interest: Google freebies from the 19th century. Ti-ping tien-kwoh: the history of the Ti-ping revolution and History of the insurrection in China: with notices of the Christianity, creed, and proclamations of the insurgents. China’s defeat in the First Opium War in the 1840’s set the stage for Hong Xiuquan’s movement, and not only geopolitically: western powers had pried open the Orient to proselytizers as well as poppies, and though Christianity would find a rough go of it in China, it did win over Hong. Fired by his supposed divine vision, Hong’s Heavenly Kingdom conquered the Yangtze Valley and much of the south, with an outlook radically progressive as against the hidebound Qing: egalitarian land distribution and gender equity (the Kingdom’s administrative acumen is less generously accounted). Naturally, the “real” Christian missionaries abhorred it, which sincere theology happily comported with the policy of their national statesmen who abhorred the Taiping’s encumbrance upon the opium trade. This illustrated podcast does creditable coverage of the Qing’s twilight century; from about 14:17, it covers Hong Xiuquan and the Taiping Rebellion specifically. The rebellion waxed while the Qing lost a second Opium War to the west, but a Taiping bid to capture Shanghai fell short in 1860. By this time, westerners had the Qing by the short-and-curlies and were not eager to see the client dynasty they had so painstakingly browbeaten supplanted by a bunch of millenarian Levellers without the common courtesy to promulgate smack; accordingly, China’s recent Opium War antagonists now helped China field the forces necessary to suppress the rebellion. Charles George Gordon, a British evangelical Christian himself destined for eventual beheading, even led the pacification force swaggeringly branded the “Ever Victorious Army“. Less exalted Taiping Rebellion prisoners, from here (click through the pages for a detailed history of the rebellion). The Taiping Rebellion features in the 2007 Chinese flick Tau ming chong (The Warlods), which represents a Qing-Taiping battle in the fine cinematic bloodbath below. Some 20 to 30 million people are thought to have perished in this civil war, which was also one of the last significant conflicts fought primarily with blades rather than bullets.